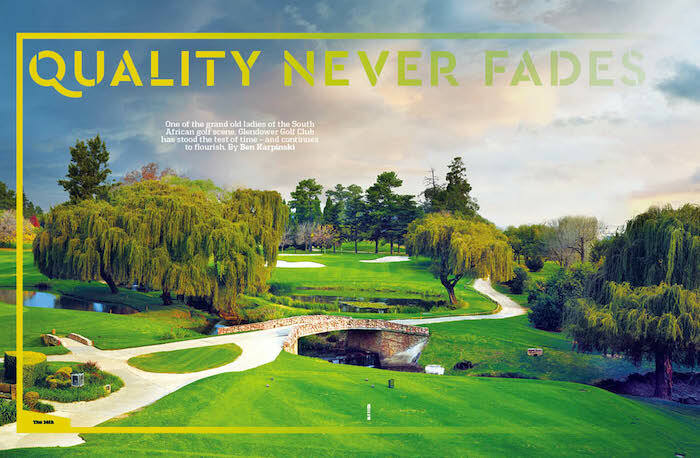 One of the grand old ladies of the South African golf scene, Glendower Golf Club has stood the test of time – and continues to flourish, writes BEN KARPINSKI in Compleat Golfer. In just about all sports, you often find yourself discussing the difference between good and great. Many are able to reach the status of good, but only a few make it past that into the rarified altitude of great. Glendower Golf Club does just that. As host of the SA Open on the European Tour for five years, our TV screens suggested as much, but when you get out on to the course and play it, the reality sinks in. It’s great in an old-world sense, as in it’s a good old-fashioned parkland test. One that has been testing golfers whether they have been using persimmon off the tees, or space-aged carbon fibre-crowned drivers, and where the trees look like they have been there from the beginning of time. Like every great course, there have been some upgrades, but Glendower’s major attraction is simply its quality. Many may bemoan its less-than-ideal location alongside one of Johannesburg’s busiest highways, or that its clubhouse is a bit of a throwback to a time when Ernie Els was still called an up-and-coming talent, but none of this matters as you take a short stroll to the 1st tee. You quickly realise another thing about Glendower. It is a rather difficult golf course. Don’t be fooled by those winning scores at the SA Open; this is a layout that will test you from start to finish. The ominous fairway bunker down the right of the 1st and precarious trees down the left set the tone on a solid par-four opener. And this is one of the easier holes. In fact, if you are playing Glendower for the first time, spending some time on the ample driving range beforehand is a good idea, as the first seven holes all require a decent amount of golfing ability. The par-five 2nd hole is as daunting a tee shot as you may get as a social golfer, and it doesn’t let up from there, even when you find the fairway. Anything left of this hole runs the risk of getting wet, and if you are even-par after these opening holes, you deserve a hearty pat on the back. That’s because this won’t be the case after the next three holes. During the SA Open, the 3rd, 4th and 5th played the third-toughest three-hole stretch on the European Tour in 2017. Over the 2017 and 2018 tournaments, they played a collective 559 over par, with the rest of the course playing 725 under par. The par-three 3rd is a breathtaking short hole with water to the left of the green and a large tree to the right. Great to photograph, but not as much fun with a long-iron in hand. Walking up to the 4th tee, you catch a glimpse of the beastly back-to-back par fours that await. Measuring 435m and 425m respectively from the club tees, these two holes also exhibit the stroke indexes of one and three. Demanding off the tee, even more so with the approach to the greens, you are well and truly in a championship test on these holes. The Glendower design is naturally hard but fair, and even though these holes are challenging, knowledge of where to go can still provide opportunities for golfers at all levels to keep the scorecard intact. The par-three 6th hole measures 168m and may look like it offers some respite. You would be wrong to think this, though. Water guards the front of the green, and the back-to-front playing surface provides many a slippery putt that needs to be carefully considered. One of the best holes follows in the form of the par-four 7th. Rory McIlroy didn’t have too much difficulty with it in the third round of the 2017 SA Open, holing out for eagle from the middle of the fairway. But us mere mortals shall have a vastly different experience. From a raised teeing area, anything too far left will make going for the green nearly impossible. The temptation is to lay back a bit to widen the landing area, but with a carry over a not-so-subtle ‘sloot’ and cavernous bunkers guarding the front of the green, you need to ensure you can attack the green with some sort of loft in your hands. The par-five 8th is a gentler prospect from the tee, but narrow in nature from there on with numerous bunkers looking to trip you up. The front nine comes to a close with a par four where you may only need an iron for placement. This is probably a good idea as anything off-line may make the approach to a green guarded by water on the right a little too much for the already frayed nerves. Halfway through the round, you understand why people speak highly of this course. Every hole is a story in its own, where par is a real achievement and every facet of your game is called upon to perform. The second nine has a rather different feel to it, but is no less impressive. The 10th is a spectacular downhill par four with well-positioned fairway bunkers and a carry over a beautiful expanse of water to the green. Par is a welcome score, but things do get a little easier on the short par-four 11th. The let-up is short-lived, however. The 12th is a mesmerising par four cut in half by a stream that provides a unique risk-and-reward situation for the tee shot. In the winter months, with the harder fairways and a helpful breeze, big hitters can have a dash at the green with driver, but placement is key here to ensure the par. The 13th, 14th, 15th and 16th offer a series of delightful holes of a more manageable nature, including two par fives. Owing to the long nature of the course, they are not necessarily reachable par fives, but with the right strategy they are certainly scoring holes if you keep it on the straight and narrow. The 16th is one of the few more straightforward holes on the course, starting your route back home with a unique finish to your round. On the par-three 17th you suddenly have giant palm trees on your horizon, and with that a demanding short hole edging on the 200m mark. The natural slope will guide you slightly left, which is just as well, as the lone right-hand bunker is a place that makes par a very difficult proposition – especially when the flag is tucked up on the right side. The 18th hole may seem unassuming, with a decent drive seeing you carry the fairway bunkers positioned on the right. The green, however, is somewhat raised and always a little tricky to navigate. If you are able to bring the ball in from right to left, your chances of finishing with a flourish are that much greater, and will provide a fitting end to a tremendous golfing experience. Now that Glendower is not hosting the SA Open, Mike Burnard and his team have been able to return the layout to its more friendly original design. The fairways have been cut wider again to incorporate the contours of the bunkers. And with its all-round conditioning and immaculate greens the championship experience is one that always offers something for all levels of player.